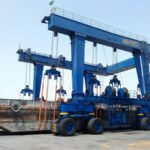 35 ton marine travel lift for sale is a multiple-function device. 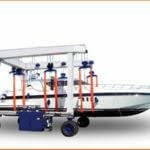 It is mainly used for boat lifting, transporting and maintaining. It is also used for loading and unloading material in factory, plants, port. It has powerful loading capacity, reliable performance, flexible move, simple structure and high safety. 35 ton travel lift for sale mainly has two operate ways, cabin control and ground remote control. The former type, operator can sit in the cab and move together with the travel lift, and operator has better view. The latter type is also flexible, operator can operate the travel lift from distance. This can protect the operator safety. 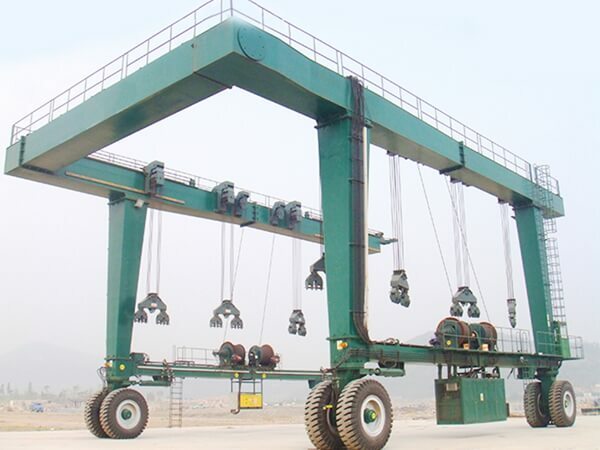 Our company is a professional boat hoist crane manufacturer in China. 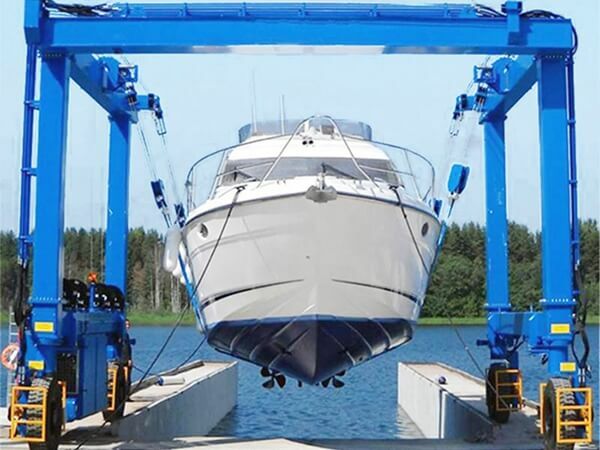 We have reliable travel lifts for sale, such as construction travel lift, dock travel lift, light duty boat hoist, heavy duty boat lift, remote control travel lift, cabin control travel lift. 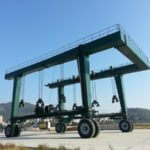 For suitable customized vessel travel lifts, just send inquiry to sales@marinetravellifts.com . Compact structure. 35 ton travel lift has simple system. It is mainly composed of u frame, electrical parts, travelling mechanism, lifting mechanism. 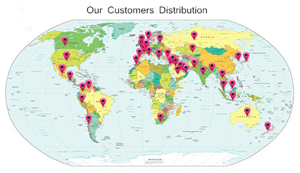 It is easy to take daily check work, maintain and repair. This can save much energy and time. Flexible wheels. The wheels can accomplish travelling towards any direction. 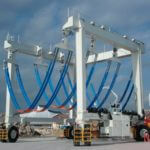 This makes crane traveling flexible, stable and easy. The tires even has the ability of climbing the gentle slope. Durable slings. The slings are strong and soft. They can lift the heavy boat stably without harm on the boat surface. Large loading capacity. 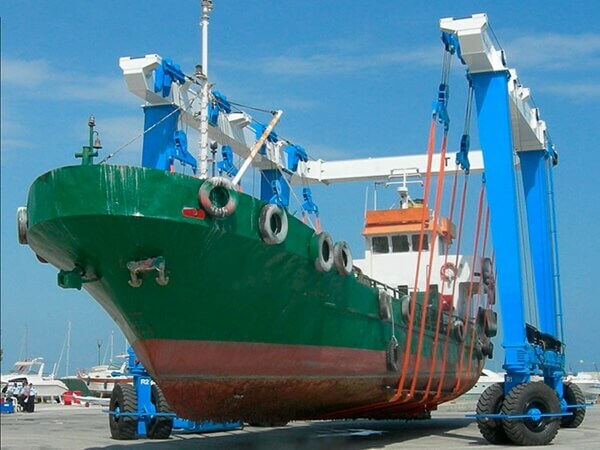 35 ton marine travel lift can finish heavy duty work stably and effectively. This makes it high efficiency. 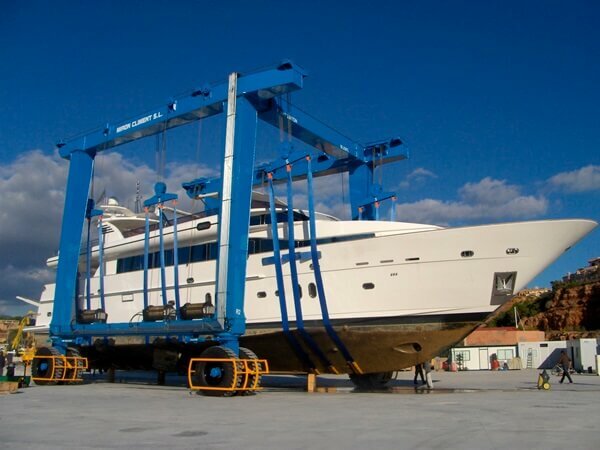 Why choose marine boat hoist cranes? 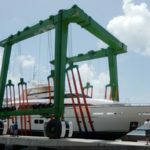 When the boats you need to move approach 150 ton to 500 tons, you need a mobile boat hoist that’s been engineered to handle the load. These heavy-duty haulers meet or exceed every standard that applies for the safe, economical transportation of your boats. With our travel lift, you can be sure that no shortcuts have been taken in the manufacture or assembly. Engineers and craftsmen from our company painstakingly develop systems, processes and quality-assurance standards that are unparalleled. 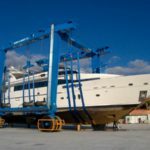 They know that your profitability in the successful moving of large boats in and out of the water, without mishap or incident, is job one. That’s why even the small details get big attention. 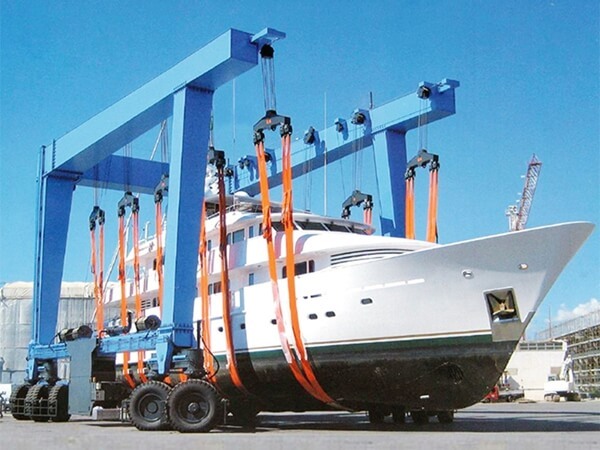 After all, you’re moving big yachts and big yachts deserve a hoist their owners can trust. As a reputable and reliable supplier of lifting equipment, Ellsen has rich practical experience and professional technology. 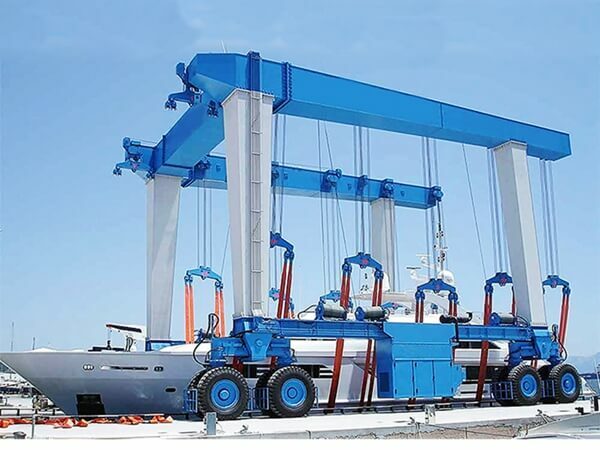 Main products from Ellsen include hoist, bridge crane, gantry crane, winch, marine travel lift, etc. Among them, travel lift is the most important and best-selling one.